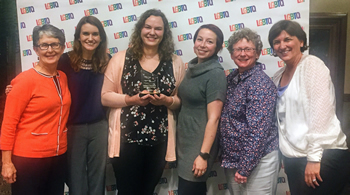 A student group at MU’s College of Veterinary Medicine (CVM) has received a 2017 Catalyst Award from the university’s LGBTQ Resource Center. Accepting Mizzou Broad Spectrum’s 2017 Catalyst Award are (from left) Eileen Hasser, Madison Minter, Rhiannon Koehler, Amanda Cox, Joan Coates and Angela Tennison, CVM associate dean for Student Affairs. 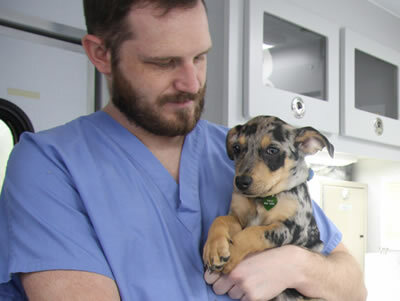 Mizzou Broad Spectrum, founded in 2015, is a chapter of the Broad Spectrum Veterinary Student Association, a North American group that works to promote acceptance and inclusion in the veterinary profession. The Catalyst Awards is an annual event aimed at bringing together activists, volunteers, students and local residents to recognize individuals or organizations who work to support the LGBTQ+ community. LGBTQ+ is an inclusive initialism for lesbian, gay, bisexual, transgender, intersex, queer, questioning, asexual and other individuals who self-identify on sexual orientation and gender expression. Established in 1998, the awards were originally created to honor activists who worked to bring sexual orientation to the UM System non-discrimination policy. According to the LGBTQ Resource Center, the awards “honor those who speak up, out, and often” for the LGBTQ+ community. Mizzou Broad Spectrum was nominated for the award by its faculty advisors, Joan Coates, DVM, MS, DACVIM, a professor of neurology at the CVM, and Eileen Hasser, PhD, a professor at the Dalton Cardiovascular Research Center.